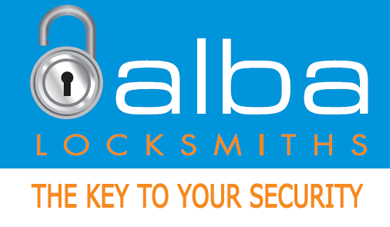 Part three of Alba Locksmiths‘ five-part series that leaves you amazed at the amount of great things a locksmith can do for you. You never knew that they were so talented did you? Ensure all your locks are fitted correctly, work properly & are the right lock for the job. Have a trusted locksmith do a security review of your home. It should be free, with no obligation to purchase. It should show urgent security needs down to ‘like to have’ security so that you can get things done as money allows. Fit both front and back doors with deadbolts. Access control locks (aka digital locks) with their keyless entry can make life easier and could improve your security as you can set different codes for different people. Extra security aids like peepholes, door chains & hingebolts can also be fitted. All ground floor windows should have window deadlocks and safety stays fitted. Louvre windows – a high security risk. Replace these windows or glue each pane securely into its slot, or fit window grilles to cover them. Outward opening French doors should have a quality deadlocks or patio bolts fitted. Ranchslider locks should have a double-keyed lock which will lock both sides with a key, and on the inside have a snib lock. Patio bolts can also be fitted to the internal side. Use the correct padlock on such doors & openings; your locksmith can supply you with the proper padlock for the purpose, also hasp & staple fittings or padbolts to secure the padlocks to. Internal access garage doors (doors into your home) should be fitted with a deadbolt. Access control locks can be used here too. Don’t forget that you can have many types of locks keyed alike; there’s no reduction in security, but it’s more convenient for you. Become a Security Smartass, read more Part 4 !